20150917 - Up in the am and dropped D of at school on the way to work. In the conference room almost all day and the mountain of work grows. Stuck in traffic for an hour on the way home... Home and changed and D drove me to G's scrimmage. We missed most of it, about done with baseball and it hasn't even started... Home and G got cleaned up and we watched some TV. Gma&paW came down to see J's soccer game and get some dinner. All back to the house for a minute and then boys to bed. 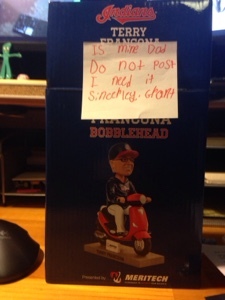 When I went into my office tonight I found the cutest note on a bobble head G got at a baseball game. He brought about 5 of them home and I said we were going to put them on ebay. His note, 'Is mine dad do not post I need it Sincerely Grant' :-) I stayed up really late and tried to get caught up on 16 months of blog entries: April 2014 and May 2014.